“I dreamt that I was begging my friend not to go fight with rebels in Antananarivo, the capital of Madagascar. When I woke up I checked the atlas, and I was right. Antananarivo is the capital of Madagascar! I didn’t know that I knew that.” As this dreamer’s story illustrates, our brains don’t shut down when we sleep. Instead, they give us dreams—dreams that are weird and wonderful, scary and surreal. For all their mystery, though, research continues to show that dreaming is very important to human well-being. Early research revealed that when we dream our eyes move rapidly side-to-side beneath our eyelids (called rapid eye movement, or REM sleep) and our bodies are practically paralyzed. 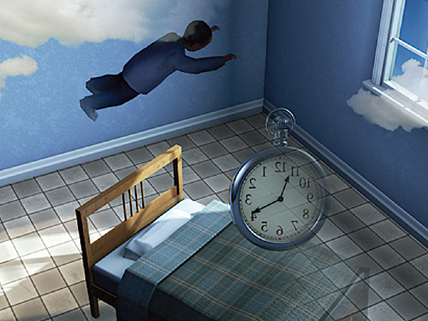 Now researchers have found that we also dream during non-REM sleep. The dreams that occur during the two types of sleep differ in quality. Non-REM dreams tend to be positive and pleasant. They also help us process information. For example, during non-REM sleep a test subject who had played a skiing simulation game while awake dreamt of placing his feet into deep boot prints in the snow. He later performed better on the game. In contrast, dreams during REM sleep are more disturbing. In fact, people diagnosed with depression often go straight to REM sleep, bypassing the non-REM part of the sleep cycle. Dreaming can also enhance our creative side. Many scientific and technical innovations have been credited to dreams. We can even train ourselves to dream about a topic that has us stumped. Chances are good that dreaming can provide insights to the puzzle. This doesn’t mean, of course, that you should rely on your dreams to solve that knotty geometry proof! Watch the video “What Are Dreams?” or print out the transcript for this NOVA program. This Canadian site has a useful FAQ section. This international organization promotes “awareness and appreciation of dreams” and is dedicated to investigation “into the nature, function, and significance of dreaming”; check out the About Dreams tab for links to many related topics. My comment feels the need not to show up. i said interesting. This is so interesting! I mean, im glad that we have dreams, plus its kinda like TV in your head! helped me so that is y i see a day ahead!!!!!!!!!!!!!!!!!!!!!!!!!!!!!!!!!!!!!!!!!!!!!!!!!!!!!! That was a really cool article. I once had a really weird dream that there was a gorilla chasing me and then we went into my old gymnastics place and then I gave him a hot wheels car and then he started hugging and kissing me. Then the next day we got married. We had 4 human babies and 2 gorilla babies then he ate 1 of the human babies. Some pretty weird stuff!!!!!!!!!! Once I had dream that I was suffocating in outer space. Moral of story: Always clean your nose b4 sleeping. It seems that having a dream takes on a defierfnt and deeper aspect as we get older. Lyn, I can’t say I have specific dreams either, but thanks for making me feel less bothered about it. As to having a parallel universe, Ray, I think that is a great idea. I’m going to start working on dreams I can drift into and relax . whether of simple things like a gorgeous meal, practical things like a white beach and bright sunshine, or lots of campervanning holidays! I dreamed once that there was a river on my backyard and one day I saw a car floating by so I pulled it out of the water. The image in my dream of the car was so vivid I looked up the car the next day. I found it was a bmw 135is coup. I’ve never seen the car before but my dream replicated it right down to the style and color of speedometer. this is the CIA and you are all under arrest! This picture cteaurps the true essence of Venice. You can almost smell the city, feel the warmth, history and tradition.I am returning on Friday for a week visit – alone, and this picture is a great reminder as to why my soul feels at home when my feet land on the first bridge!